Let Attorney Dean Phillips help you with your weapons charge(s). He is uniquely qualified to provide your best defense because he keeps abreast of all firearms laws and is a leading NFA trust attorney. In the state of Georgia, you may not possess sawed-off shotguns or rifles, machine guns, dangerous weapons, or silencers unless you meet certain qualifications such as carrying one of these weapons in the line of duty as a member of the military. Dangerous weapons include bazookas, rocket launchers, and hand grenades or any weapon designed to injure or kill people or destroy heavy armor. The Bureau of Alcohol, Tobacco, Firearms and Explosives (ATF) regulates items like silencers. Because of their involvement and the National Firearms Act of 1934, you can possess silencers if you’re eligible. You may possess handguns and long guns without a permit, provided that you have not been prohibited from owning firearms. You can also carry these items with some stipulations. A loaded, long gun must be fully exposed, and handguns must be unloaded and in a case. In order to carry these weapons in a concealed fashion, you are required to have a Weapons Carry License. If you’ve been caught carrying without a license, then you could face a misdemeanor charge for your first offense. Second and subsequent offenses are felonies and can be punishable by imprisonment between two and five years. If you’re eligible to own firearms and have been denied a license, temporary license, or renewal license, let Attorney Dean Phillips help you obtain your license. He can present your case to a Probate Court Judge, demonstrating your fitness to own a weapon. 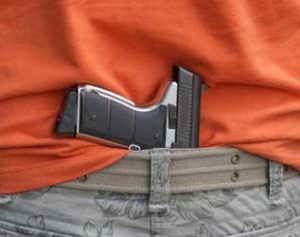 Carrying firearms, knives, or other weapons in government buildings, courthouses, and certain parking facilities like those belonging to the government or churches. You could be charged with a misdemeanor; however, there are circumstances in which you can carry weapons in prohibited locations and by which you can avoid a charge. Talk to Attorney Dean Phillips to discuss your rights. Convicted felons, including those convicted in other states, and felony first offenders that are on probation may not possess firearms. A conviction could result in imprisonment for one to five years. Georgia law covers numerous weapons-related offenses including discharging a firearm on Sunday, pointing firearms at other people, and misusing firearms or archery equipment while hunting. Each of them is punishable in some fashion. You need Attorney Dean Phillips on your side to protect your rights and to ensure that you understand whatever charge of which you’ve been accused. Convictions of weapons-related charges can result in hefty fines, jail or prison time, and probation. If you’ve been charged with any weapons-related offense, Attorney Dean Phillips will help you build a strong defense. Mr. Phillips represents those charged with weapons offenses in Marietta, Cobb County, Paulding County, Bartow County, Acworth, Austell, Powder Springs, Smyrna, Kennesaw and Woodstock. For a free consultation on your weapons offense case, call 770-415-0933.